The model OS1500-BLS backlight source is used when precise aiming of line-of-sight or fiber optic detectors is necessary. It defines the exact measurement area by projecting an image of light at the center of the spot being measured on the target surface. 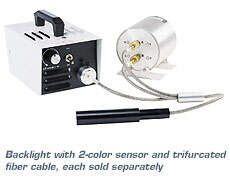 When used with line-of-sight sensors, an optional fiber cable (model OS1500-BLF) connects the detector head and the backlight source. Light is transferred down the fiber and through the lens assembly, creating a spot on the target where the temperature is being measured. The light source consists of a high intensity lamp, a dimmer control and a cooling fan. The average lamp life at maximum brightness is approximately 12 hours. No adjustments or preventive maintenance are required, other than ensuring that the air vents are clean and no residue is allowed to accumulate in the fiber chuck.